Japan has joined the growing number of major economies that are back in black. Japan’s economy grew 3.7 percent on an annualized basis from April to June this year, the first time the world’s second largest economy has seen positive growth in 15 months. The announcement of preliminary figures by Japan’s Cabinet Office comes after France and Germany surprised economists last week by posting 0.3 percent growth for the second quarter of the year. The news that Japan has rebounded — the hardest hit of the major economies because of its reliance on exports — gives economists cautious optimism that the worst of the global recession is over. “The economy has seen a bottoming out of global demand, which has pushed out net exports … especially in high tech industries and basic materials, such as chemical, steel and so on because of Chinese demand,” said Hiromichi Shirakawa, chief economist in Japan for Credit Suisse. 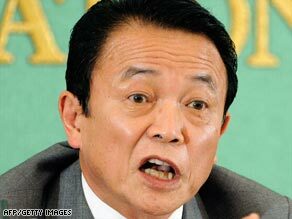 Japan’s GDP grew just under 1 percent during the three-month period and trade increased 1.6 percent. The uptick marks the end of the worst recession in Japan since the end of World War II. Japan’s GDP fell at a record pace during the January-March quarter, when GDP was 15.4 percent lower than the same time period last year. The Japanese economy was buoyed by a historic ¥15 trillion ($150 billion) stimulus package in May, which included unemployment benefits, aid to struggling companies, promotion of green industries and a variety of tax breaks. “There are many times in the past when tax breaks and fiscal stimulus were offered and failed, but this time around, it worked,” Shirakawa said. Economists expect GDP to continue modest growth through the rest of the year, especially with an expected rebound in global auto sales this quarter. But whether the recovery can continue into the new year after the stimulus package runs its course remains a question. “Japan’s economy still is quite sensitive to global demand … and for consumer demand to grow on a self-sustained basis still seems unlikely,” Shirakawa said.